Clean and wash greens until water is no longer green, but clear. 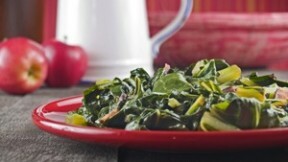 In a large pot, boil ham hocks and salt pork for about 1 hour on medium heat, then add collards to boiling ingredients. Cook for an additional 1½ hours with cover on. Add sugar and peppers and then continue cooking for an additional half hour and stir occasionally. Serve hot.